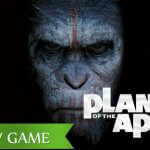 Play Planet of the Apes Touch® for real! With two different play areas, inspired by the two most recent Planet of the Apes releases Rise of the Planet of the Apes (2011) and Dawn of the Planet of the Apes (2014), I was wondering how this game would look like on a mobile device, especially on a smartphone. With two video slots in one, two times the standard 5×3 layout next to each other, how would this fit on such a small screen? If there’s one software developer in the iGaming industry that would succeed in such a challenge, it’s NetEnt. Innovation is one of NetEnt’s priorities and if a mobile game needs two play areas, it will get two play areas! As said as done, Planet of the Apes Touch® was created without giving any problems to mobile players. As usual, some slight changes can be found in the navigation while the video slot design, animations and entire gameplay has been kept intact. 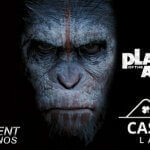 Planet of the Apes Touch® is one of the most advanced games I’ve seen so far in a mobile casino and as a player, you can look forward to an impressive list of mobile slot features. It’s almost unimaginable how many slot features you get presented resulting in constant action on the reels. Meanwhile, you’ll be taken on a journey between the two different phases of the Ape Army leader Caesar’s life which results in a remarkable mobile slot game. Besides the Rise and Dawn play areas, this exciting mobile slot offers the Rise and Dawn Free Spins, Bonus symbols, Scatter symbols, Wild substitutions, a Stacked Wild feature, a Dual feature and the Rise and Dawn Bonus features. I might be a big fan of the NetEnt Games, but it doesn’t mean I like all the games beforehand. Playing Planet of the Apes Touch®, though, my video slot heart started to beat faster, even though I’ve never seen the two films this mobile slot is based on. This simply means it has all to do with the way Planet of the Apes Touch® is designed and developed, bringing an intense mobile slot experience. The Planet of the Apes experience starts with some of the best animations and graphics I’ve seen so far in a mobile slot in which HTML5 played a very important role. The same goes for the effects visible throughout the game with apes appearing out of nowhere, climbing onto the reels, and even explosions becoming reality. This game is on fire and you now have the opportunity to enjoy all of it while on the go or relaxing on your sofa thanks to the NetEnt Touch® version. I needed a moment to process all the mobile slot features as soon as I was able to play Planet of the Apes Touch®. I’m pretty sure we’re dealing with the most feature-packed mobile slot here giving you the chance to enjoy Rise Free Spins, Dawn Free Spins, the Rise Bonus Feature, the Dawn Bonus Feature, Bonus symbols, Scatter symbols, Wild substitutions, a Stacked Wild feature, and the Dual feature. I better begin at the beginning and with that the first page of the feature guide standard available while playing a mobile slot at one of the NetEnt Casinos. You’ll be informed about the two Wilds available in Planet of the Apes Touch®, bot having the exact same function and value. They both substitute for other symbols, but will be visible in the two different play areas, Rise and Dawn. The list of slot features is led by the Dual feature, another innovative slot feature invented by NetEnt. The two play areas have an important role to play. Once triggered, which is possible just before each spin, one symbol is chosen for each play area aiming to collect as many of the same symbols in order to win big. Each of the play areas will be about different symbols and if a symbol belongs to the other play area, it might be transferred increasing your chance of incredible winnings. 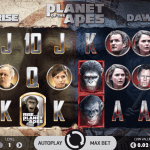 The list of slot features in Planet of the Apes Touch® seems endless and if all of the above isn’t impressive enough, there’s even more to come. The Rise and Dawn Bonus symbols, for example. A Rise Bonus symbol can land on the first reel and if it does, it will be responsible for the activation of the Rise Bonus feature resulting in an additional coin win being awarded for every human and ape symbol displayed on the reels in the Rise area. If the Dawn Bonus symbol, on the other hand, lands on the last reel, the Dawn Bonus feature is triggered. This time ape and human symbols will be transformed into the same symbol in the Dawn play area. The Stacked Wild feature is triggered on the Rise play area when a reel is fully covered by Wilds. The Stacked Wilds are then duplicated onto the Dawn play area in the corresponding position. 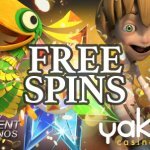 Last, but certainly not least, there are two Free Spins features of which I’m sure you’ll be truly excited when either one of them, or both, will be activated. Both, the Rise Free Spins (10 free spins) and Dawn Free Spins (15 free spins) will be activated when 3 or more Scatter symbols appear anywhere on the reels in the Rise play area or Dawn play area. During the Rise Free Spins, the number of Wild symbols that land on each reel are collected in a Wild meter on the screen. Each Wild symbol will add to the meter by 1 and after the reels stop spinning, all collected Wild symbols are randomly placed on the reels. In the Dawn Free Spins feature, you’ll be able to collect 3 different symbols that activate a corresponding meter: Multiplier, Extra Wild, and Extra Free Spins. Three symbols will be needed to fill up the meters in order to activate an x3 Multiplier, an Extra Wild and/or 3 Extra Free Spins.